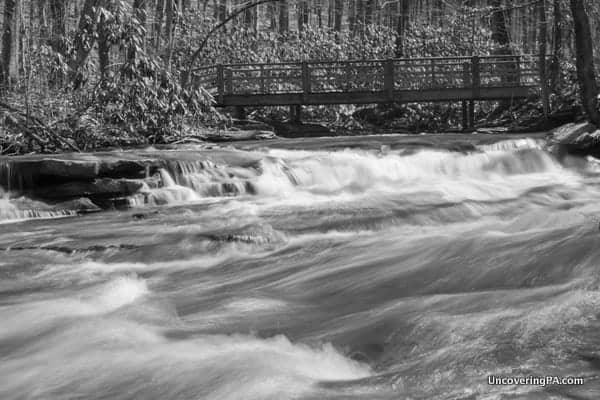 Ohiopyle State Park in the Laurel Highlands is one of my favorite parks in the whole state. 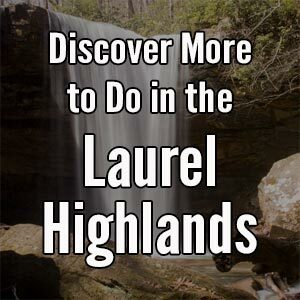 The beauty of the scenery, the quaintness of the small borough of Ohiopyle, and the many great waterfalls make this an ideal place to visit for anyone who loves the outdoors. 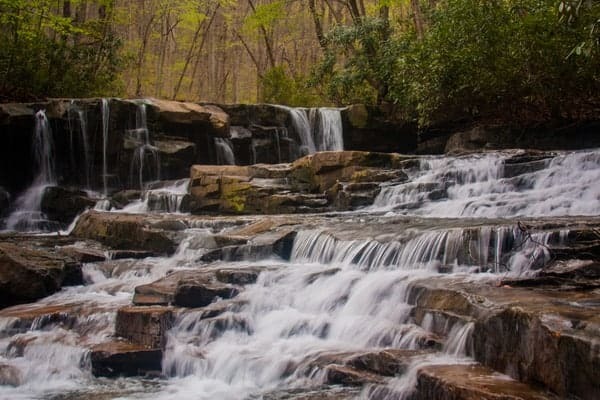 Of the park’s waterfalls, most people take the time to visit Ohiopyle Falls and Cucumber Falls because they are quite impressive and fairly easy to reach. However, for those that are willing to venture a bit further, there are several great secluded waterfalls scattered throughout the park. 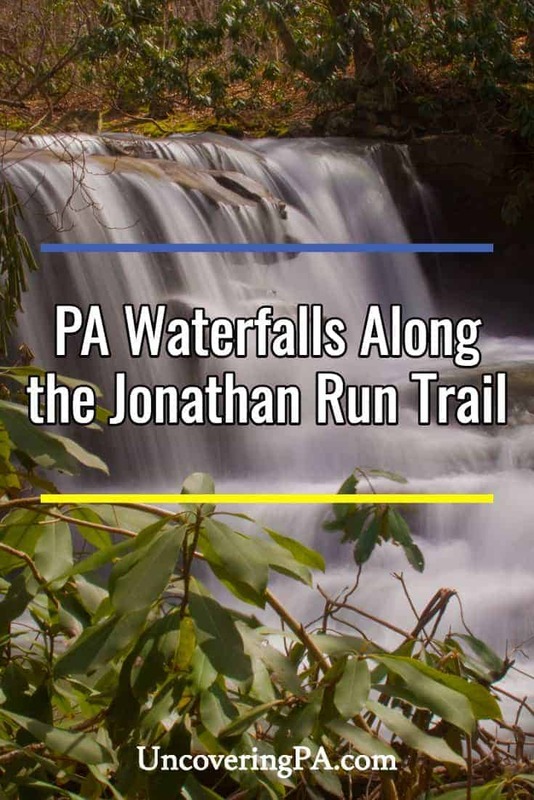 One of the best for those willing to do a bit of hiking is the waterfalls along the Jonathan Run Trail. The trail actually has two nice waterfalls on it, even though only one is marked on the park map. There is also another seasonal waterfall just off the trail that’s worth seeing as well. 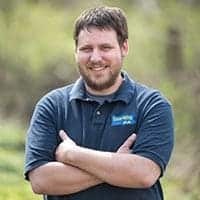 The parking area for the Jonathan Run Trail is located in one of the most secluded areas of the park at the following GPS coordinates: 39.891966, -79.507884. The trail runs 1.7 miles along Jonathan Run from Holland Hill Road to the Great Allegheny Passage trail along the Youghiogheny River. The trail itself is fairly easy, with only a few small hills and narrow spots to deal with. The cascading Jonathan Run flows below a bridge on the Jonathan Run Trail. The hike along the trail is quite pleasant as it meanders along Jonathan Run. During periods of higher water, Jonathan Run has many small rapids that cascade down the stream, making the whole scene that much more beautiful. The several small wooden bridges that cross these cascades are the perfect place to capture photos of this beautiful water. After about a mile of hiking, the Jonathan Run Trail meets up with the Sugar Run Trail. If rain has been quite plentiful recently, a short side trip up this trail can take you to Fechter Run Falls. To get there, head up the trail just a few hundred yards until you cross a small, rustic wooden bridge over Fechter Run. Immediately after crossing the trail, follow the water downstream to your right for about 50 feet to get to the small, but quite striking, Fechter Run Falls. Fechter Run Falls. If you want to photograph this waterfall, it’s best not to visit on a sunny afternoon. Back on Jonathan Run Trail, continue down the trail just a few minutes further. 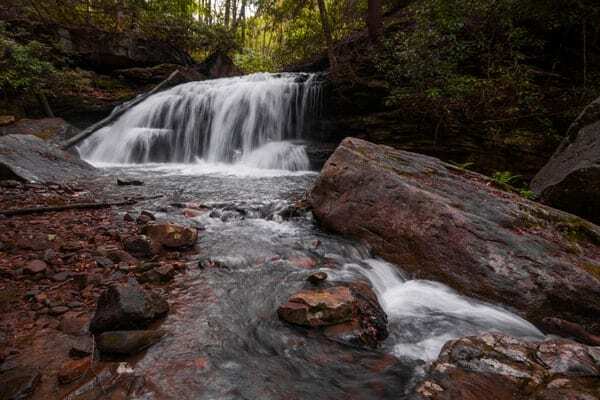 You’ll cross over a sturdy wooden bridge and immediately come to the split-off for Kentuck Trail, which heads up to the Ohiopyle State Park campground. Approximately 100 yards after the trail, you should be able to hear Upper Jonathan Run Falls in the gorge below you. This waterfall is not on the Ohiopyle State Park maps. While there is a bit of a worn path down to the waterfall, there is no maintained trail. If you opt to descend to the waterfall, use caution as the path is quite steep in places. Also remember, if you go down a steep hill, you have to come back up it at some point, so make sure that the ascent is within your ability. 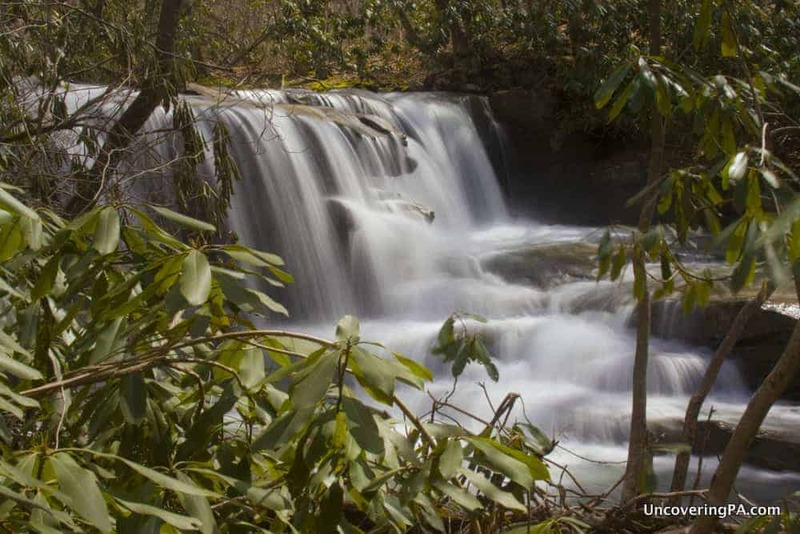 Upper Jonathan Run Falls as seen during my second visit to Ohiopyle State Park. The waterfall itself is quite striking at all times of year. 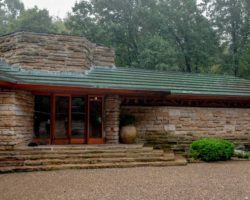 However, during especially rainy times, it can get a bit overwhelmed and lose a bit of its shape, as I unfortunately experienced during my visit. Either way, this is a great waterfall to visit and, from my experience, is the easier of the two to reach. After hiking back up Jonathan Run Trail, head down the trail for a few more minutes. Lower Jonathan Run Falls, the one actually on the map, is a bit trickier to find than Upper Jonathan Run Falls. 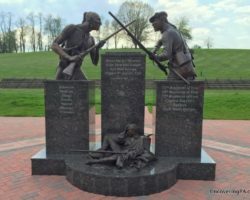 To get here, you’ll either need to head down a much steeper and more difficult trail down to the falls, or walk up the stream from near where Jonathan Run Trail meets the Great Allegheny Passage. Neither way is especially easy, but the beauty of the waterfall certainly makes it worthwhile. 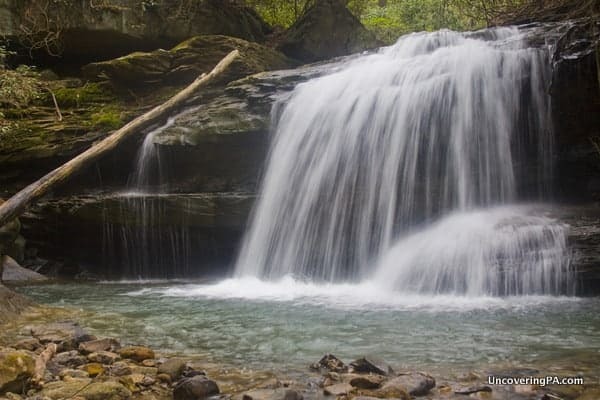 However, should you be only feeling adventurous enough for one of the waterfalls, I found Upper Jonathan Run Falls to be more beautiful and easier to reach. Lower Jonathan Run Falls. Getting down to the bottom of the gorge is very difficult, but offers a great view of the falls. 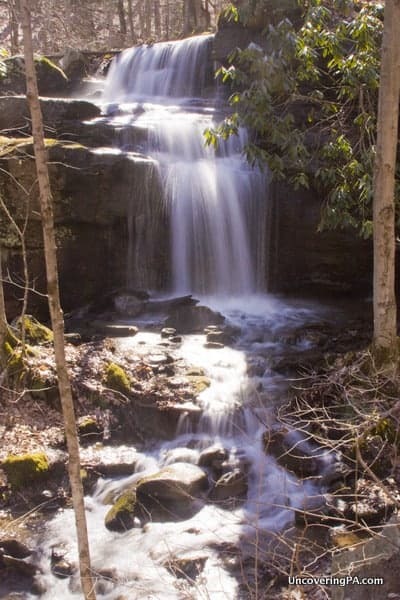 Whether you visit one, two, or even three of the waterfalls on or near the Jonathan Run Trail, it makes for an excellent and scenic hike into the more secluded areas of Ohiopyle State Park. 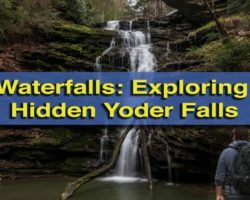 Want to find out about more waterfalls in Pennsylvania? 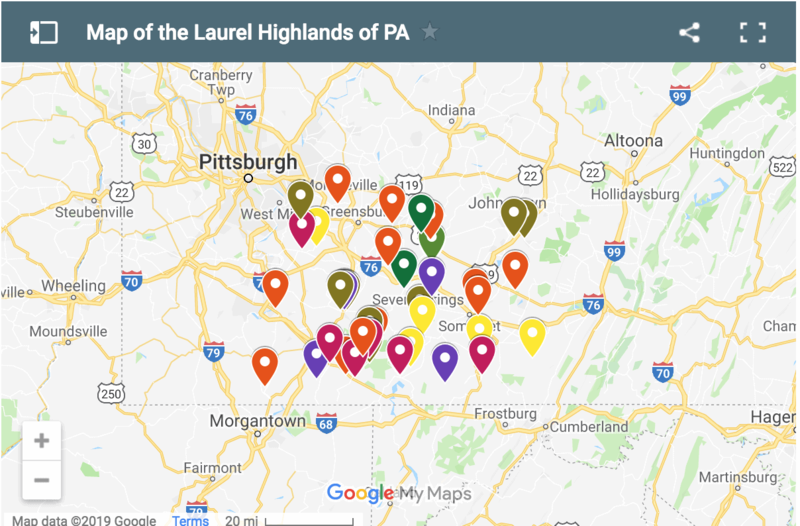 Visit our Pennsylvania Waterfalls page to see them all!